Meet Morgan Young, he was born in Grass Valley, California. He was raised primarily in this small town but spent about a year on the east coast when he was in middle school. In his free time, he escapes to the outdoors to spend time with his family; camping, adventuring, hunting and fishing. He lives life to the fullest and always pushes his family and friends to do the same. Outside of his personal life Morgan is very passionate about his business. Morgan has been working in the family’s business for the past seventeen years. He started part time while he was in high school. After College he went to full time starting in June of 2005 to present. During this time, he has gone through every position in the family flooring business only advancing once he was able to perform all aspects of the positions and then train a replacement. For the last six years Morgan has been the General Manager for two locations managing up to thirty-five employees and working with up to fifteen different subcontractors daily. In the last nine years Morgan has trained many of the installers, given installation advice and trouble shot possible problems. He also has estimated the company’s jobs with the highest standards and integrity to insure the customers are getting a quality and professionally installed floor that they deserve. Morgan along with his wife of 11 years, Brittany and brother, John purchased the family business from his father Randy Young in January 2017. 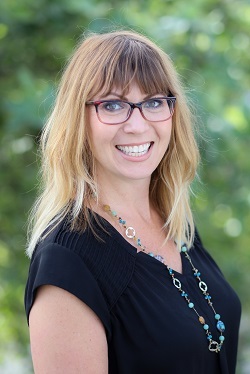 Meet Owner and Sales Manager Brittany Young, she was born and raised in the Nevada County area. When she isn’t working, she enjoys spending time outdoors with her husband and two amazing daughters. Brittany started at Youngs in 2004 as a dedicated sale person. In 2006 she was presented an award at the Carpet One convention called “The Journey Continues”. Despite being twenty-three years old she managed to stand out from hundreds of other candidates. Now more than ten years later she has stepped off the sales floor and has moved into the Sales Manager position where she is able to help other staff members grow. In January of 2017 Brittany, her husband Morgan Young and brother-in-law John Smith all officially purchased the company from her father-in-law Randy Young. Meet Ashley, she moved to Nevada City in 2007 from Petaluma, when she was 19 years old. On her days off she enjoys taking hikes, working out and cooking. Ashley started with Youngs as the receptionist, where she quickly excelled. Over the years, has continued to hone her skills in design and color and attended many trainings on products. Ashley has been a sales consultant for the past 6 years and was recently promoted to Assistant Sales Manager. She specializes in tile design for bathrooms, kitchens and living spaces. With that, she is also a consultant for hardwood, carpet, vinyl and window coverings. Meet Gabe, he was born in Romania and moved to Grass Valley in 2015. He enjoys taking his son to go exploring and gold panning in the surrounding areas. Meet Heidi, she moved to Grass Valley in 1991 with her husband Dave. She enjoys camping and the outdoors with her beautiful family including her amazing husband, son and daughter! Heidi has been working in the accounting department since she started with the company back in 1997. She considers herself blessed to have been able to have both children by her side while working. Meet Kaetlyn, she was born and raised in Grass Valley. Outside of work she enjoys taking hikes, going to the river, attending concerts and creating artwork. Kaetlyn started working for the company in 2015 as the receptionist. She quickly started taking on more responsibilities before out-growing the position in 2017. She is now Brittany Youngs assistant, coordinating pricing, helping with marketing & managing all the social media and websites associated with the company. Meet Karen, she moved to Grass Valley in 2003 from Petaluma. She enjoys spending her free time outdoors. 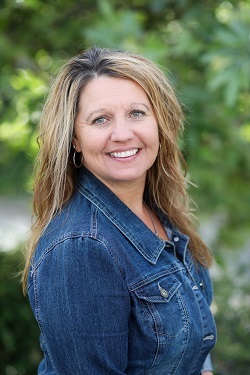 Karen began working for Mike and Pam Tigue at Sierra Tile and Stone up until 2007. She has recently returned to Sierra Tile and Stone/Youngs Carpet One ten years later! She handles accounts payable along with payroll. Meet Adam, he was born and raised in Grass Valley, CA. In his free time he enjoys being outdoors. Adam began with the company in 2015 in the accounting department. He also provides clerical and technical support. Meet Logan, he was born and raised in Nevada City. He loves to fish, hunt and be outdoors. Logan worked for Youngs back in 2002 as a crew member and eventually was installing. He left the company and came back in 2016. He is currently managing our tile warehouse and has recently been trained to install and remove Hunter Douglas shades. Meet Hilary, She was born in San Antonio, Texas but moved to Nevada County at the age of one where she was raised. On her days off she enjoys spending time with her family, traveling, fishing and doing yardwork around her house. 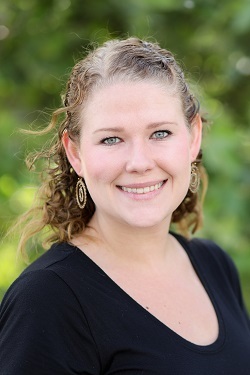 Hilary started working for Sierra Tile & Stone in 2006, following her graduation at CSU. She graduated with her BA in Interior Design. She is a color specialist with an eye for design. Hilary also specializes in sketch rendering along with interior and exterior design. She transitioned to Youngs Carpet One as part of the sales staff in 2009 where she continues to help design and remodel homes. Her husband is a general contractor so they get to work on many jobs together. Meet Tim, he was born in Las Angeles and moved to Lincoln in 2013. In his free time, he enjoys relaxing, watching sports and fishing. Tim started working for Youngs in 2013 as an installer. He specialized in laying hardwood, sheet vinyl, LVP/LVT and carpet. In total Tim has 30 installation years under his belt. In 2017 he moved into the store as a sales professional. His installation experience is a huge benefit to his sales knowledge. Meet Chuck, born in Oklahoma and moved to Nevada County at age 4 where he was raised. In his free time he enjoys the outdoors, hunting, fishing and spending time with his beautiful family and farm animals. 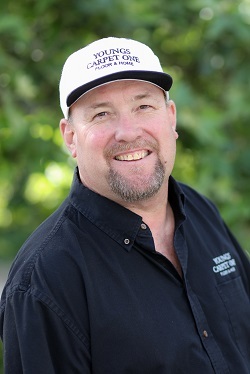 Chuck started working for Youngs in 2004 as a commercial installation crew member. He moved up the ladder and was installing on his own in 2006. He specialized in sheet vinyl and custom hardwood installations. Over the years he completed several courses for floor installation. In 2014 Chuck was promoted to sales inside the store and was able to use his extensive knowledge of flooring and installation to guide customers in the right direction when purchasing flooring. Since then he has also completed a Schluter Systems workshop which helps his knowledge for the tile side of the business. Meet Hanna, she was born & raised in the Grass Valley area, but lived in San Diego for 4 years while she attended college. Outside work she enjoys being outdoors, hiking, traveling, playing with her dog, doing yoga, & being creative & crafty. Hanna joined the sales team in 2019. She has experience in real estate home staging and interior design. She enjoys helping customers find the perfect product to meet their needs while keeping style in mind. Meet Cori, she moved to Grass Valley from Truckee in 2007 when she was ten years old. In her spare time she enjoys going to the river, taking hikes and playing with her doggies. Cori started at Youngs just over a year ago as the receptionist. She greets customers, reconciles accounting daily and also deals with Hunter Douglas repairs. Kaetlyn started working for the company in 2015 as the receptionist. She quickly started taking on more responsibilities before out-growing the position in 2017. She is now coordinating pricing, helping with marketing and managing all the social media and websites associated with the company.